We are going GOLDEN..to the Golden Globes that is! Lots in the pipeline, one of the most exciting things happening now, we were invited to gift at the upcoming 2013 Golden Globes! We have been plugging away creating by hand, over 100 small pieces that will be gifted to the celebrities and press attending the Globes! In addition to our gift bags we will have a representative at the Globes to show the celebrities our work and have them take photos with our display pieces! We are hard at work dreaming up the jewelry we will be creating for our display! The display will be created from pieces of salvaged wood and a lot of manual labor! The pieces of jewelry for the display will likely be created exclusively for the Globes using mother of pearl, gold and turquoise eco-friendly materials (perhaps the ring above as well). We will certainly share photos with you once we get everything to the Globes in January! 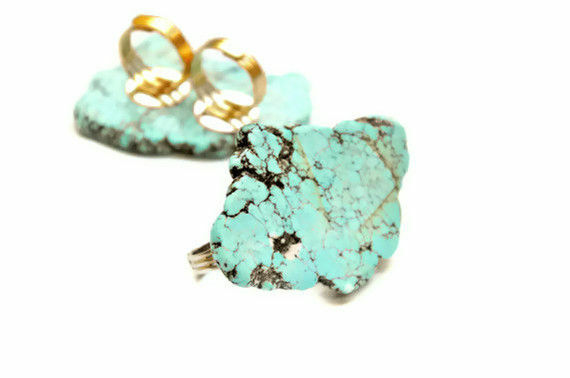 Posted in MISC and tagged adornments, art, artist, artists, award show, bead supplies, beads, best of list, boho, boho chic, buy local, california, california art, celebrity, celebrity gifting, crafts, creation, delicate, earrings, etsy, etsy deal, etsy shop, gift bags, globes 2012, globes 2013, golden globes, handmade, handmade gifts, handmade jewelry, handmade rings, inspiration, jewelry, los angeles, necklace, retail, shop local, sundance, turquoise, unique, vintage. Bookmark the permalink. 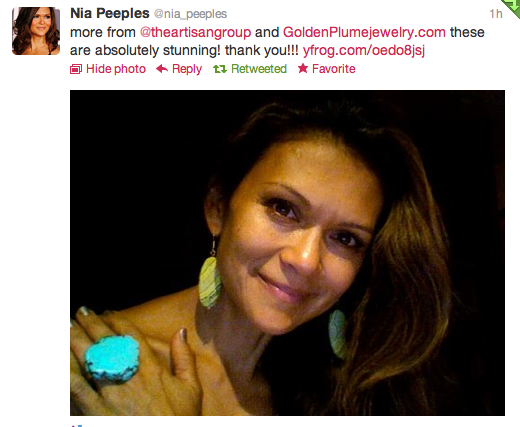 Fantastic color on a gorgeous lady – Nia Peeples ! Posted in Celebrity Plume and tagged adornments, art, artist, artists, bead supplies, boho, boho chic, buy local, california, california art, celebrities, celebrity, celebrity gifts, crafts, creation, delicate, earrings, etsy, etsy deal, etsy shop, fashion, for sale, handmade, handmade gifts, handmade jewelry, handmade rings, inspiration, jewelry, los angeles, necklace, nia peeples, retail, sale, shop local, turquoise, unique, vintage. Bookmark the permalink. Recently Golden Plume was accepted into the Artisan Group, a group for handmade artists to gift to celebrities at events like the CMAS and the Oscars. We are so happy to be apart of such an elite and interesting organization for artists to get amazing exposure for their handmade local craft. As of late the group has offered several one-off gifting to celebrities like Ryan Gosling and Jordan Sparks. Garnering great success, many celebrities who receive their gift bags reach out via twitter and other social platforms to thank the artists for their generosity. This is why I’m jumping over the moon with excitement for a fantastic opportunity given to Golden Plume. Tomorrow I will personally create and package a few fab Golden Plume adornments for Ms. Jenny McCarthy! 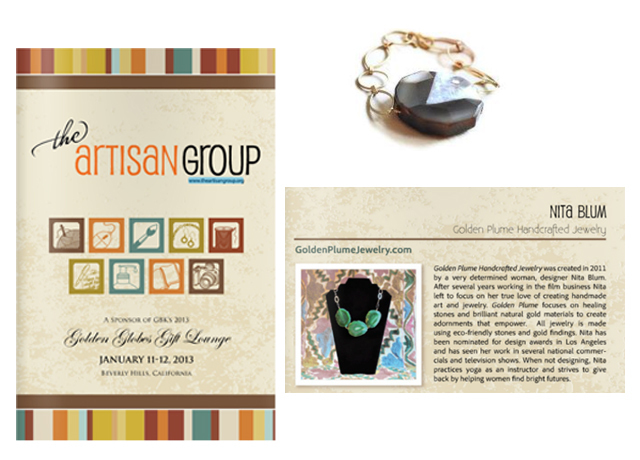 The Artisan Group will be gifting some handmade goodies to Jenny in a few weeks and Golden Plume will be included!! 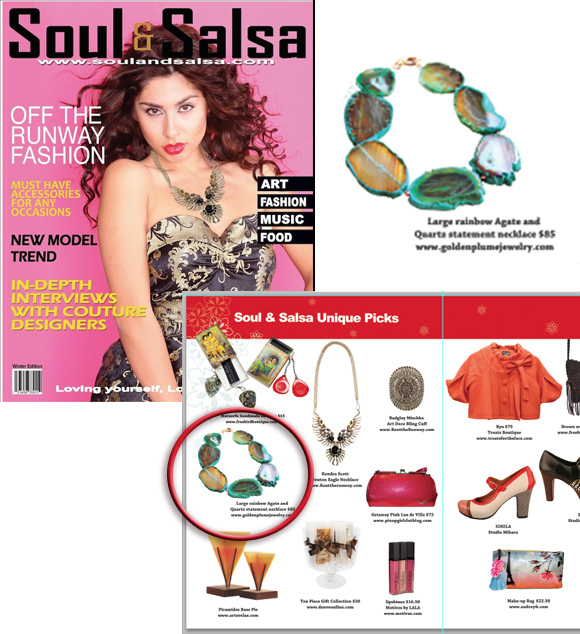 We are very excited for her to receive our pieces and perhaps wear them around town. Aiming for a simplistic look, since Jenny seems to wear little jewelry in her photo appearances, we have designed a healing stone necklace made of rose quartz for Jenny and of course we will send her a pair of our Golden Triangle Earrings just for a fun night out. This is a great opportunity and we are truly thankful to The Artisan Group. 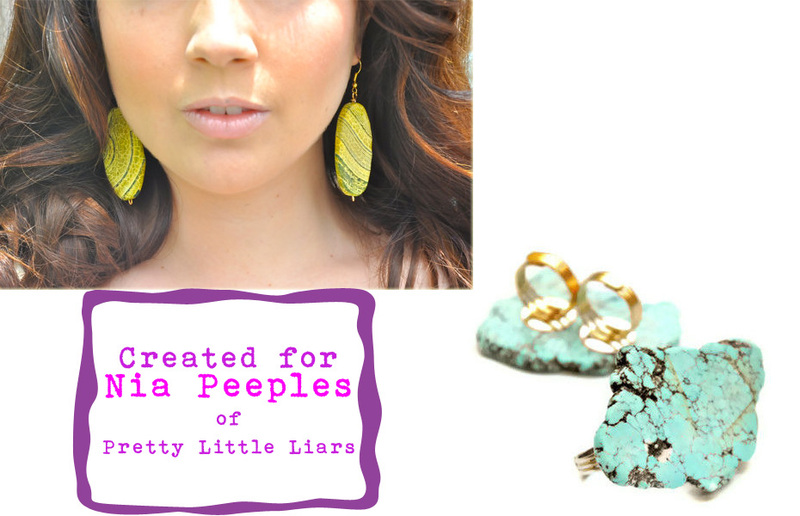 If you get a chance check them out by clicking the icon below, they have some wonderful photos of celebrities wearing handmade items! Posted in biz end and tagged adornments, art, artisans, artist, artists, bead supplies, best of list, boho, boho chic, buy local, california, california art, celebrities, celebrity, celebrity gifts, crafts, creation, etsy, etsy deal, etsy shop, famous, fashion, for sale, gift bag, gift bags, handmade, handmade gifts, handmade jewelry, inspiration, jenny mccarthy, jewelry, los angeles, necklace, oscars, retail, shop local, the artisan group, unique. Bookmark the permalink.